Each small group was assigned a different task. One task, entitled Snapshots of History, had students diving into the different decades of the Iditarod. Obviously, students needed to find out how many different decades the race has been in. They would then determine, through research, a picture that could represent that specific decade. For example, one group determined Susan Butcher was the clear-cut choice for their 1980’s picture. Students created a collage using PicMonkey. Another task is creating a Fakebook profile for Joe Redington, Sr. A favorite status update for students was about Joe and his dogs summiting Denali. This task was quite appealing to my students as most are very familiar with Facebook. For my artistic students I had a task to design a flag for the Iditarod. After designing their flag, students illustrated their flag on their computer using the tool Sketchpad. This tool allows students to save their flag to their Google Drive as an image. They then could share the image with me. A fourth task was the Cartographer group. Their task was to map out the Iditarod trail on Google My Maps. In addition to mapping out the trail, the students had to provide a short description of each checkpoint. 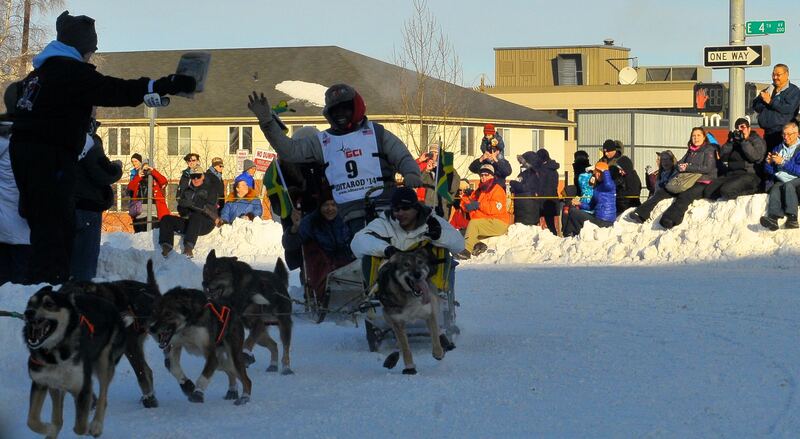 Finally, for my musical students was a task to compose a song for the Iditarod. Students chose a song and replaced the lyrics with the lyrics they wrote. When they were ready to sing their song, they used the tool Audiotool to edit. My students enjoyed doing this activity in class. Each student was grouped based on interest. All students learned a great deal about the history of the Iditarod, each group presenting their information in a manner best suited to their interest. Check out the lesson plan below. Included are websites to get to the tools the students used to complete their task. There are also websites listed to aid students in their research. So this year everything I’ve touched has gone to the dogs… and that includes my Robotics Club! I work with a group of fourteen fourth and fifth graders once a week after school using Lego Mindstorms to begin to explore programing and basic robotics. We usually spend the fall semester learning how to program and use the various sensors we can add to the robot and then in the spring semester we compete in a series of challenges… a Summo Tournament, a Triathalon, and this year the Robitarod! 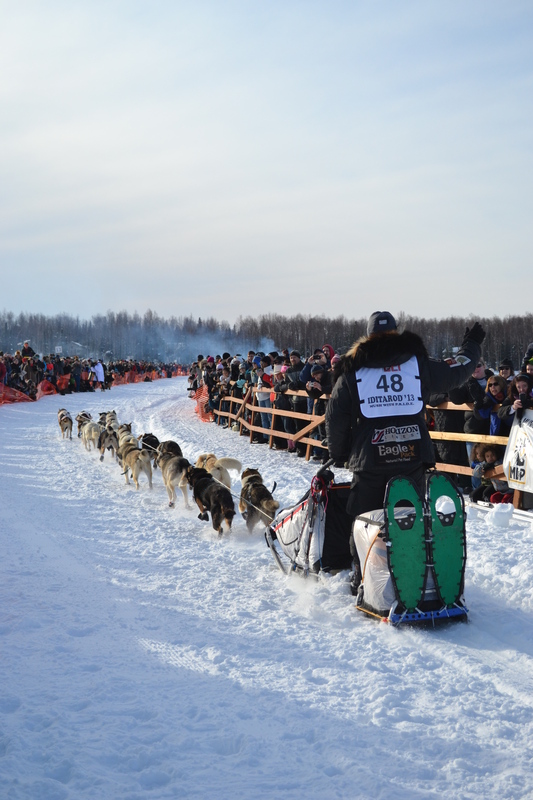 Rule 15 — Sled: A musher has a choice of sled subject to the requirement that some type of sled or toboggan must be drawn. The sled or toboggan must be capable of hauling any injured or fatigued dogs under cover, plus equipment and food. Braking devices must be constructed to fit between the runners and not to extend beyond the tails of the runners. There must be space in the sled for a dog to fit. There must be an allocated place for the musher to stand. There must be allowances for where equipment and food would be carried. There must be evidence of a braking device between the runners of the sled. From there, they got to determine which of the remaining six events to attempt and in what order. The challenges required them to take what they had learned in programing, using sensors, and from the earlier challenges and use them in new and unique ways… and all while pulling a sled! Some teams quickly learned that attaching a sled to their robot really changed the game. It seemed to affect the drivability and maneuverability of the sled. It was also a great exercise in strategy. There just wasn’t enough time to do all of the challenges. So, the question becomes do you do the ones you perceive as being the easiest first? Or the ones that are worth the most points first? And then somewhere near the end, one team started going for partial points at several stations and that proved to be a game changer too! Earlier in this school year as a part of our study of National Parks and as a wonderful tie it to the dog sledding theme that runs throughout my school year, my students and I did a Distance Learning Field Trip with Denali National Park. [LINK] This is a wonderful program that is presented by the rangers in Denai via Skype. Through pictures, videos, discussions, and hands on activities, the ranger introduces the kids to the sled dogs who help patrol the park in the winter to access areas that are not opened to motorized vehicles. One of the questions which came up was, “What happened to the dogs when they were too old to work at the park?” We learned that the retired dogs are adopted by families all over the United States. 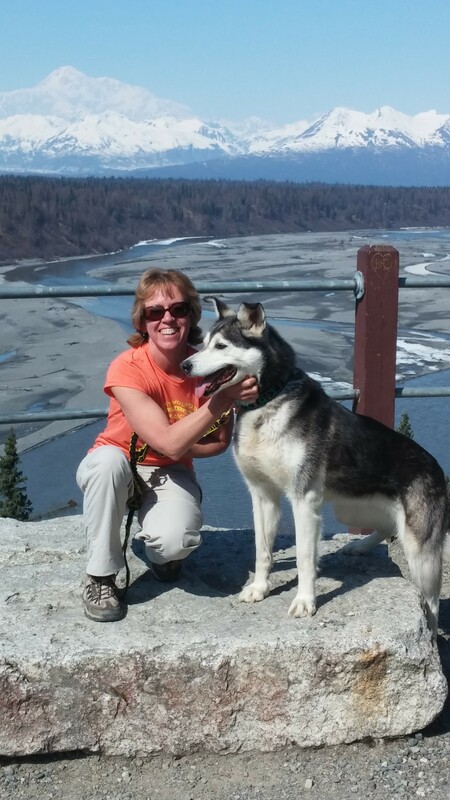 While I was on the trail this year, I was contacted by Sharon Winter, with the exciting news that she and her husband Dan were lucky enough to be adopting a retired Denali sled dog! She was wondering if there was a way to keep the kids involved in the sled dogs’ lives and for them to learn what it means to be “retired” to a sled dog. Sharon and Aurora on retirement day! Check out Denali in the background! This week, my class had the chance to meet Sharon and Dan and their newest family member Aurora, via Skype from their home in Eagle River, Alaska. Aurora’s full name is Princess Aurora Sparklepants! She wasn’t born at Denali, but was given to the park when she was young. She is now nine years old and has been living with the Winters for just about a month now. They also have two other dogs, Amos and Snoopy. Snoopy is a tripod dog, but he gets around just fine! 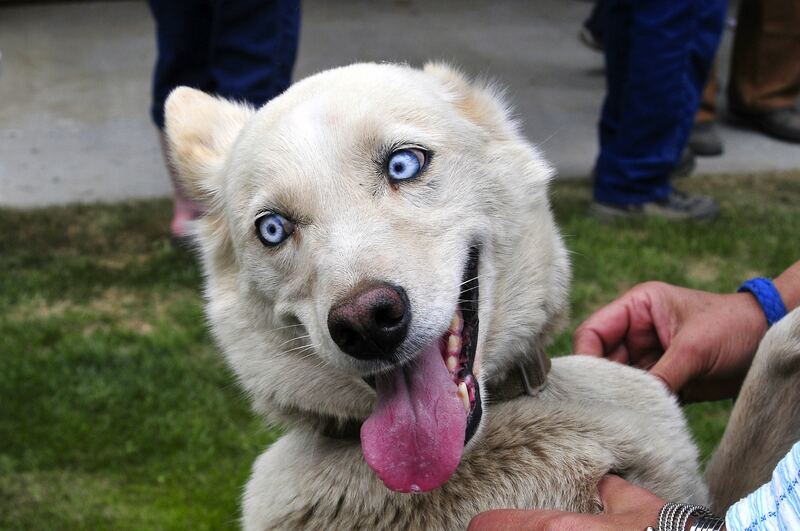 We learned that going through the process to adopt a retired Denali sled dog can take years! There is a long application process that prospective families have to go through, including providing references. The park looks at where the dog will live (both in terms of climate and kennel space at the home), if the families are active and can provide enough exercise, and if the families have experience with dogs. It’s really nice to learn that the park works so hard to ensure that their dogs are well cared for in their retirement. Sharon reports that Aurora’s retired life is pretty different then her working life, but still pretty different then a pet dog’s life! She has a dog house outside of the house and has her own fenced in area. The fence both keeps her in and any wildlife in the area out. She goes for several long runs and walks a day, and spends a lot of time with the family outside during the day. They are trying to get Aurora used to being inside the house too. She has really never been inside before! When they first brought her in she wasn’t used to anything in the house! She was scared of the ceiling fan. She doesn’t like the noise of the TV either. She really prefers to be outside. We had a really wonderful time talking with the Winters and their dogs. We learned a lot about how sled dogs live their lives when they are retired and it was a great way to wrap up our sled dog filled year! I have had a jam packed three weeks doing pre-trail Skypes with schools all over the country. It’s been a lot of fun to talk Iditarod with kids of all ages and all levels of experience with the race via Skype in the Classroom. One of main goals while I’m out on the trail is to try to connect with these schools live from the trail! I’m hoping to be able to share the energy and excitement of what I’m experiencing at the checkpoints with all my Skype schools and my own students. I’ll also be blogging and reporting here, so be sure to check back frequently! Here’s to all the classes who are going to be joining me on this adventure…. Hope to see you from the trail!